The magical allure of Provence with its almost ceaseless sunshine, blue skies, marvellous scents of herbs and spices, magnificent natural scenery and unique art, is a true paradise. Built in the typical Provencal style, this 'bastide' is situated on a 40 hectare property in the nature-rich hinterlands. This magnificent estate, which was renovated to preserve the authentic historic features, continues to make an active contribution to the delicious local winemaking. The large swimming pool can be found near the bastide, adjacent to the vineyard; this is an excellent place to relax and unwind from your daily cares with a lovely glass of house-made wine in hand. There's a fantastic patio in the shade of the plane trees, which is very well suited to enjoying lunch or playing a game of petanque. You can do all this while enjoying a private concert provided free of charge by the numerous 'cigales'. 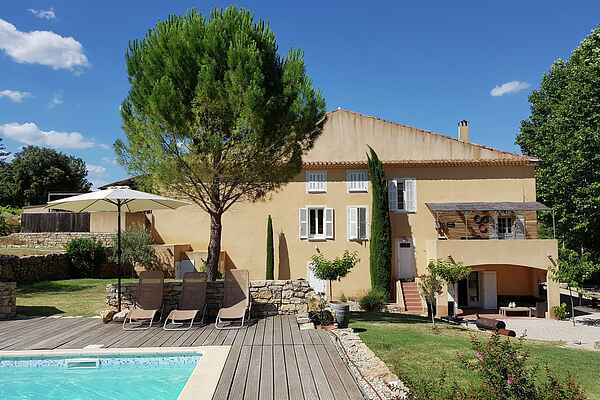 The bastide is the perfect base for exploring the Var: among the many places to visit are the Gorges de Verdon, the Lac de Sainte Croix and the beautiful Mediterranean coast with St Tropez, Antibes, Cannes and Nice. If you prefer to stay closer to home then theres the splendid Romanesque abbey in the village of Le Thoronet or the quaint villages of Carcès and Entrecasteaux with its various bistros where you can sample the local Provencal cuisine. With its extensive grounds and its outstanding location, the bastide is excellently suited to having a successful holiday and is also a great place for friends, clubs or companies to meet.